I am available for private lessons in Buffalo, as well as lessons over FaceTime or Skype. Please contact me if you would like to learn more. My mission as a private teacher is to make myself obsolete. Teaching a student a standard of excellence in listening, self-analysis, fundamentals, and musical logic is at the core of our journey together. Rather than simply copying my demonstrations, I engage students to make decisions at every step of their study, regardless of their age and ability level. A typical lesson will consist of a warm-up of Call & Response, where the student mirrors what I play — usually Buzzing, Long Tones, Slurs, Articulation, Scales/Arpeggios, and other simple exercises. This is not only a time for them to develop aural skills, but to hear and see professional playing up close. Depending on age level, we will then move on to études (short study pieces) and short exercises. I stress the study of études, and assign several at a time so students can work on a variety of musical styles and technique. After études, we will move on solo repertoire. Each student is required to keep a notebook, where not only can I record assignments, but they can also keep a practice log. This is essential to establishing efficient, effective practice. 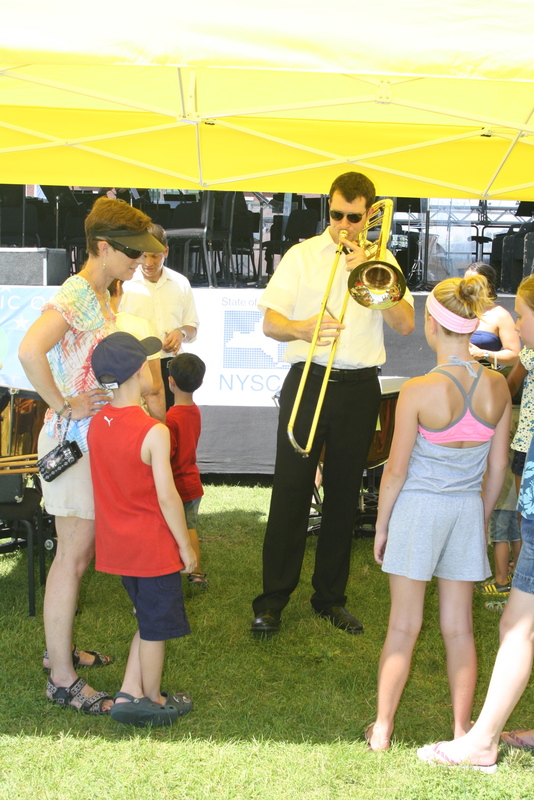 Students are often preparing for NYSSMA, ECMEA, collegiate, or other kinds of auditions/performances. We spend a great deal of time on repertoire required for these events, but I stress that these auditions are merely a checkpoint along the course of study, and not a terminal event. Maintaining a balance of practice material keeps our study fluid and avoids falling into the teaching to the test category that, unfortunately, consumes many other students. The skills students learn from private music study translate to all aspects of life: personal standards, problem-solving skills, objective [self] analysis, project management skills, and the realization of a direct relationship between quality work and its rewards. One of my greatest rewards as a teacher is witnessing students correlate these skills to other facets. Along with instruction, I believe students need to see their teacher(s) or other professional players perform. The reinforcement of lesson material that this experience provides is immeasurable. Not only am I performing every week with the BPO, but I frequently perform in solo, recital, and chamber settings in and around Buffalo. In addition to my methods, I am also greatly networked to many of the higher institutions in and outside of WNY. I maintain relationships with many of the professors that you or your child may end up auditioning for, should he or she choose to continue musical studies in college. As you can see in the Master Classes/Recitals tab of this website, I frequently visit universities around the country and keep current with requirements and standards. Finally, I thought it pertinent to also share my personal history of early musical studies. As you’ll see, I found my way to the music profession a bit differently from many of my peers – even threatening to quit many times along the way! It just goes to show you that you never know where you’ll end up. I grew up surrounded by music from an early age, singing in the church junior choir and taking piano lessons since first grade. When given the opportunity to choose an instrument in the fourth grade, I was drawn to the saxophone, but a close family friend urged me toward the trombone. As junior high school was coming to an end, I wanted to quit both trombone and piano to focus on sports. My parents allowed me to choose one instrument to drop, and I chose to quit piano. The logic was simple: both of my parents took piano lessons as children, so they could tell when I was just screwing around. On the trombone, however, everything sounds like you’re screwing around at that age so my practice went unmonitored! Marching band played a large part of my freshman year of high school. It was a huge social event, including parades and trips, plus having upperclassmen in my circle of friends was pretty cool. My interest in band and trombone started to fade, however, and I once again threatened to quit. Upon a dare from my band director (a wise man), I auditioned for the Berks County Honor Band and was rewarded with both a spot in the band and orchestra – and two days out of school for rehearsals! After that, I was hooked. Aside from getting out of classes for music festivals, I met passionate, young musicians who greatly influenced me. Playing in the band went beyond a social experience, and became an obsession and passion of mine. As a senior, I not only auditioned for – and won – a position in the local youth orchestra, but also every Pennsylvania honor band and orchestra, up to the Pennsylvania All-State Orchestra. My decision to go to college for music came rather late, as all of my college applications were submitted for Political Science/History. Halfway through my high school senior year, I started thinking that music would be a fun course of study in college, as it appealed to me as a cross between academia and trade school. While researching music programs, I randomly ran a web search for “Trombone studio” and the first hit was the website of the Ithaca College Trombone Troupe. The picture that came up was of about 25 trombone players lined up overlooking Cayuga Lake on the campus of Ithaca College. The trombone nerd inside me finally broke through, and I knew I had to be a part of this. The rest, as they say, is history……errr…..practice. Love the personal testimonial! How much of life’s trajectory begins as pure happenstance!